You must be a member of the Madrid English Book Reading Group to attend this activity. Would you like to join this group? This book has won a stack of awards: Kirkus Prize Nominee for Fiction Protected content , Goodreads Choice Award Nominee for Historical Fiction Protected content , International DUBLIN Literary Award Nominee Protected content , Book of the Month Book of the Year Award Nominee Protected content , and has received some very good reviews. Here is a brief idea of what the book's about, taken from Amor Towles's personal website. 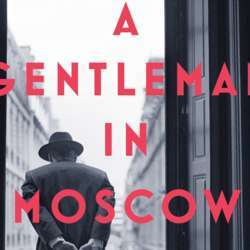 A Gentleman in Moscow immerses us in another elegantly drawn era with the story of Count Alexander Rostov. When, in Protected content , he is deemed an unrepentant aristocrat by a Bolshevik tribunal, the count is sentenced to house arrest in the Metropol, a grand hotel across the street from the Kremlin. Rostov, an indomitable man of erudition and wit, has never worked a day in his life, and must now live in an attic room while some of the most tumultuous decades in Russian history are unfolding outside the hotel’s doors. Unexpectedly, his reduced circumstances provide him a doorway into a much larger world of emotional discovery. Please ensure you read at least some of the book, so you can join in with the discussion, although if you don't finish it, it's no problem. New members are always welcome, we're a friendly group and we have some lovely discussions. Have a lovely Sunday and see you all in February!